Day 01: Machame Gate (1828m) – Machame camp (3020m). Your day starts early with breakfast, followed by a 1 hour drive from Arusha (86km) to the Machame Gate (1828m). The guides and porters prepare and pack the supplies and your equipment at the gate. After registering at the gate office, you start your ascent and enter the rain forest almost immediately. There is a strong possibility of rain in the forest, which will transform the trail into a very soggy, muddy and slippery experience. 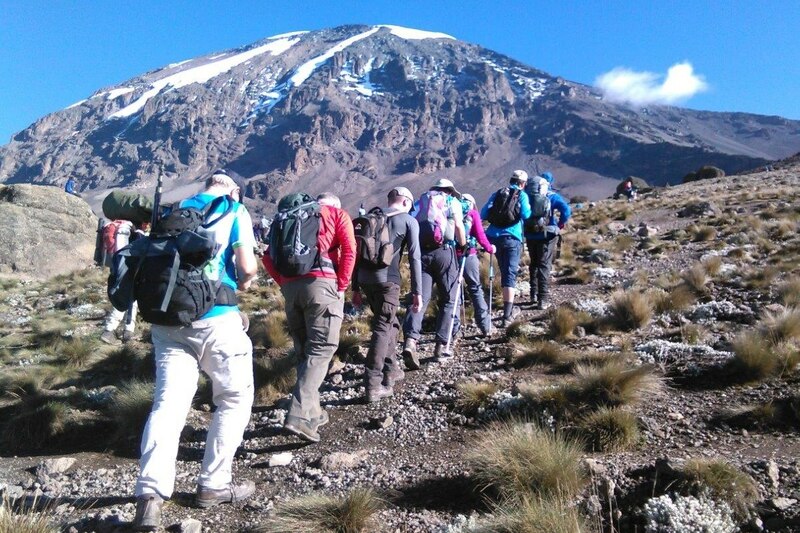 You will have a welcome lunch stop about halfway and will reach the Machame camp (3020m) in the late afternoon. Day 02: Machame camp (3020m) – Shira camp (3847m). Day 03: Shira Camp (3847m) to Lava Tower (4642m) to Barranco camp (3984m). Day 04: Barranco camp (3984m) – Barafu camp (4681m). The last water stop on the route is the Karanga Valley, as there is no water available at Barafu camp. Barafu is the Swahili word for “ice” and it is a bleak and inhospitable camping area to spend the night. Totally exposed to the ever-present gales, the tents are pitched on a narrow, stony, and dangerous ridge. Make sure that you familiarize yourself with the terrain before dark to avoid any accidents. Day 06: Mweka camp (3090m) – Mweka Gate (1641m). From the Mweka Gate you will continue down into the Mweka village, normally a muddy 3 km (1 hour) hike. In the Mweka village you will be served a delicious hot lunch!! After lunch you drive back to Arusha for a long overdue hot shower, dinner and celebrations! From Arusha City, after breakfast your safari guide will pick you up from your hotel to Arusha park, one-hour drive to take you to Arusha National Park.The African Arusha National Park’s three most significant features include the rugged Mount. Meru (Tanzania’s second highest peak at 4566m), the notably different coloured Momela Lakes, and the 3km wide Ngurdoto Crater, which was formed about fifteen million years ago! The varied and beguiling animals and flora found in this game reserve are mainly determined by the different altitude and geography of these 3 “zones”. You spend a full day in the park, maximizing your opportunities to spot the excellent range of animal and birdlife it has to offer. A picnic lunchbox is included in the day tour. At early evening , you make the short return journey back to Arusha City, where you should arrive at evening to drop you off at your hotel. Day 08: Arusha to Tarangire National Park. Day 09: Tarangire to Lake Manyara National Park. Day 10: Ngorongoro Crater to Arusha.